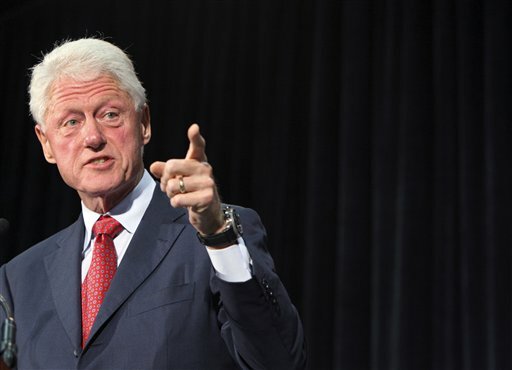 Yesterday, on the 11th anniversary of 9/11, former President Bill Clinton hit the stump for President Barack Obama–breaking a campaign pledge not to launch political attacks on 9/11, and flat-out lying about Romney/Ryan and Medicare. Clinton’s lies expanded upon of his attacks at the Democratic National Convention last week–and National Public Radio broadcast his fabrications without further comment or necessary fact-checking. [Obama] didn’t weaken Medicare–he strengthened it. He didn’t weaken Medicare Advantage–he strengthened it. But if you repeal the health care law, and you repeal these savings, you are going to weaken Medicare Advantage, you are going to weaken Medicare, it is going to run out of money quicker, you are going to really weaken the senior drug program. Those are the facts. That’s the arithmetic. According to NPR’s Gren Allen, even the mathematicians in the audience swooned. Obamacare cuts $716 billion from Medicare–according to the Congressional Budget Office!–and Medicare’s own actuary warned the cuts will hurt services. Obamacare cuts $145 billion from Medicare Advantage–and Democrats have long resented Medicare Advantage for offering seniors the option of private insurance. Clinton’s claim about Medicare running out of money sooner is false–and ignores the fact that Romney and Ryan have a plan for saving Medicare in the long run. The “senior drug plan” was established under President George W. Bush–over the objections of liberal Democrats–and can be reformed outside of Obamacare. Those are the facts. That’s the arithmetic. NPR does not consider the other side of the argument, nor does it note that Clinton violated the Obama campaign’s promise about politicking on 9/11; instead, it gives credit to Clinton for bringing up the memory of the attacks before ripping into the GOP. It is to be expected that a disbarred politician who was impeached for lying under oath might lie. But one (really!) expects more from taxpayer-funded NPR, which has exceeded even its own sorry history of bias.